This document explains the details of the user ID file, which contains settings unique to each user institution and user workstation. Note: In BG-Map 2016 and later, you can also edit user setup by going to Tools/Options/User Setup in BG-Map. What is the User ID File? The user ID file contains settings unique to each user institution and each user workstation. It is located in the c:\bgmapwin\userid folder on the local c: drive of each BG-Map workstation. The file name is USERID.FIL. Its function is analogous to that of an .INI file. BG-Map will not work properly if the information stored in the User ID file is incorrect. Why Would I Edit the User ID File? The primary reason to change the user id file is to provide the correct paths to BG-Map and BG-BASE data on a network server. If folder or drive letter assignments are changed, this will be required. How Can I Examine the Contents of and Edit the User ID File? Using Windows Explorer, go to the c:\bgmapwin\userid folder. Double click on the icon for the program file: User Setup.exe. This is a utility program that allows you to view and update the contents of the User ID file. These items, listed on the left side, are for developer use only and should not be changed by the user. 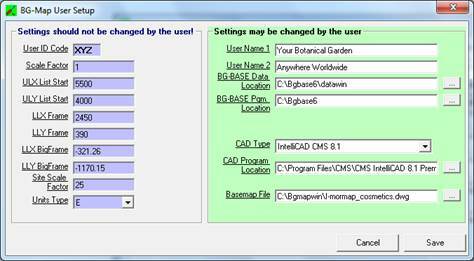 CAD Type – Select the version of AutoCAD or CMS IntelliCAD that you wish to use with BG-Map.